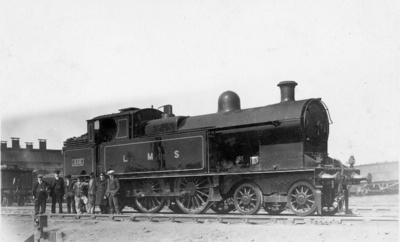 The loco is obviously an LNWR 4-6-2 'Superheater Tank' engine, newly painted in LNWR lined black but with 'LMS' on the tank sides. So presumably, the date is 1923. But two queries: where is it? And who are the men gathered on the left? The vehicle on the right in the middle distance is lettered 'L O C O'. The shed looks very much like Buxton where these tanks were based for many years. Was the event celebrating the first LMS painted engine to arrive there? An interesting livery. LNWR no. 2384 (later LMS no. 6995) was similar. It now seems this is not Buxton. Another view clearly taken on the same occasion but without the men shows an engine in the background at a lower level with the bottom half of the driving wheels out of view. This is not possible at Buxton so the original thoughts I had are now out. Another photograph on the same occasion, without the men, was taken by P.F. Cooke (of Huddersfield) from a lower and closer camera position. A bit of a Webb engine (an 0-8-0?) is visible behind the buffer beam of no. 316, on the same level. Yet another, almost identical to the mystery photo but without the men, and with the headlamps arranged differently, is reproduced in the Stephenson Locomotive Society's Journal, November 1956, p303. This one is by W.H. Whitworth (of Manchester), but the location isn't mentioned. But he doesn't suggest where the photo might have been taken. I think the location is Patricroft (New) Shed. The ground signal in its recess is just like that seen in a photo of Patricroft in Hawkins & Reeve's 'LMS Engine Sheds' vol 1, page 174. The rail-chairs also seem to match; the low sun would be in the south-west, and the loco coal wagon on the right would be conveniently placed for the coal stage. As to the identity of the men, the six on the left look like railwaymen, and the seventh man looks like a visitor. As both W.H.Whitworth and P.F.Cooke were present with their cameras on this occasion, presumably to record the first loco at Patricroft lettered "LMS", maybe the man in the wide white cap is P.F.Cooke. It certainly isn't W.H.Whitworth, so perhaps he took this photo. Just a guess, of course.